A Blue cheese mousse recipe is a tastefully simple gourmet food. Blue cheese has a sharp and robust flavor, making it one of the best cheeses of the gourmet world. Serve blue cheese mousse as a canapé and watch your guests keep coming back for more. Blue cheese, also known as bleu cheese, gains its distinctive flavor due to its appearance being distinguished by a pattern of blue-green veins running through the cheese. This blue mold pattern is what distinguishes blue cheese from other types of gourmet cheese. There are many blue cheese producers from all over the world. Blue cheese is made with cow's milk, goat or sheep's milk. Some brands continue to mold the cheese in caves, and some inject the cheese with spores of moldy bread. There is a lot of diversity when it comes to blue cheese production. Known as one of the best blue cheeses in the world, Roquefort is a pride of France. Made from cow's milk, Roquefort has a creamy texture with a robust spicy flavor and complements many French appetizers. This famous blue cheese made from cow's milk is the pride of Italy. It has a delicate creamy texture with a mild, sweet flavor. Made from a mixture of cow, sheep and goat milk, Cabrales is one of the most distinguished cheeses from Spain. Cabrales has a very robust spicy taste. Danish Blue, known as Danablu, is Denmark's most well-known blue cheese. Danablu is a semi-soft cheese with a mild and salty taste. Stilton cheese is an English blue cheese still handcrafted in Britain, made from cow's milk producing a soft, light texture. Blend blue cheese and cream cheese until smooth, either by hand, electric mixer or food processor. 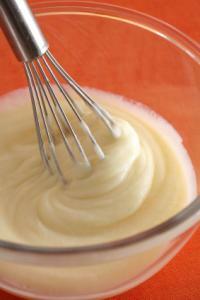 While blending the cheese, slowly add the heavy cream (optional). Mix together until evenly blended. 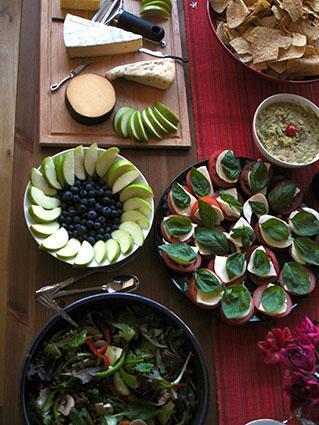 Serve as a canapé on crackers, or toasted bread. Place mousse into a pastry bag and add on top of gourmet crackers. Garnish mousse canapés with walnuts and halved red grapes. Blend softened blue cheese with cream cheese until blended smooth. Stir in the Worcestershire sauce, parsley, spices and mustard. Dissolve one package of unflavored gelatin into hot water. Fold the cheese mixture into the gelatin and chill until firm. Gently fold in the whipped cream and set inside a mold. Chill mold for four hours, or until firm. Serve as a side dish or as an appetizer; garnish as desired. A variety of condiments and garnish complement the unique flavors of blue cheese mousse - why not experiment with some of these simple, yet delectable gourmet foods? A blue cheese mousse recipe is usually quite visually appealing and versatile served either as a side dish, canapé or appetizer.